Before I even went to China, I had romantic expectations about its food due to its portrayal in Western media. I remember watching a documentary about Sichuan (or Szechwan in English) cuisine where an old Chinese chef talked about how the food he served in his family restaurant dated back to some decades ago and was passed on from generation to generation. He spoke about his food with passion and I remembered thinking that every spoonful of his food must have rich nuances of his family’s history in its taste. 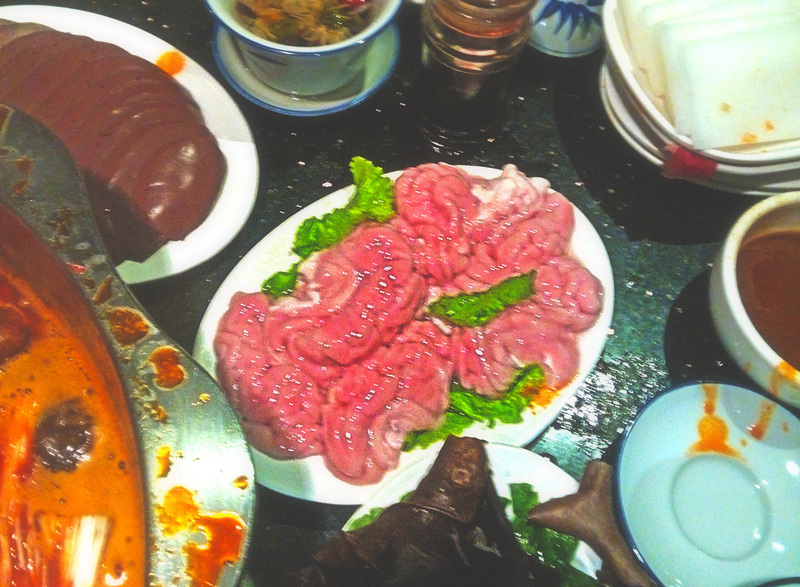 When I arrived in China, however, I was, to say the least, underwhelmed by how Chinese cuisine actually was. Perhaps the oily, fatty fares served in our company canteen was to blame. Each dish in that canteen didn’t seem like it was prepared with passion, but rather with sloppy, careless haste. The dishes in the small eateries that locals frequented near my apartment wasn’t any better either. All hope is not lost, however. As vast as China’s territory is, so is its culinary offers. My first taste of good Chinese food was a home-cooked meal by a friend whose hometown is Chaozhou City, known for its delicious food. From this, I realized that maybe I was just looking for tasty Chinese food in the wrong places. Good thing my work colleagues love going to restaurants so I get to taste different kinds of Chinese food. 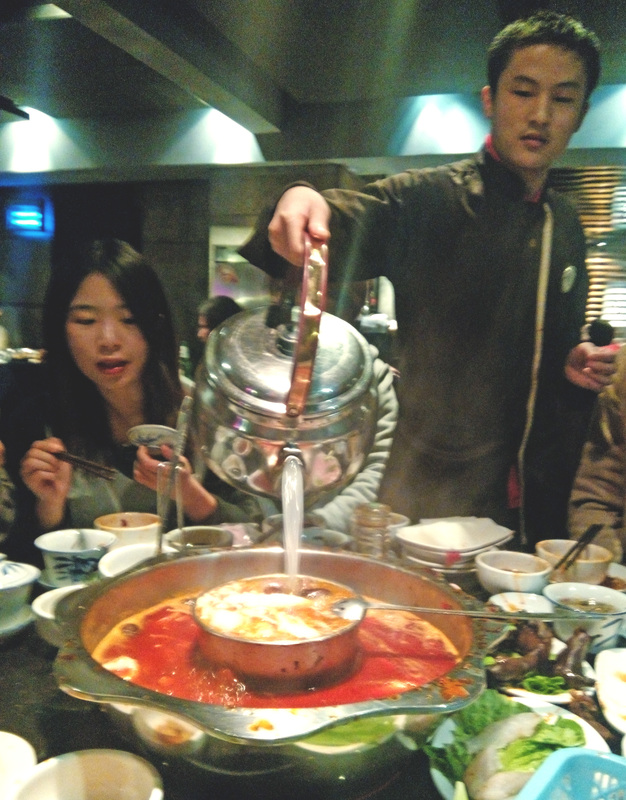 One of the more popular dishes here is the hot pot, where you basically put all kinds of ingredients (from meat to vegetables) in a boiling pot of seasoned water. There are all kinds of hot pot too! One time, we went to a restaurant that specializes in having sweet coconut juice as their soup base. 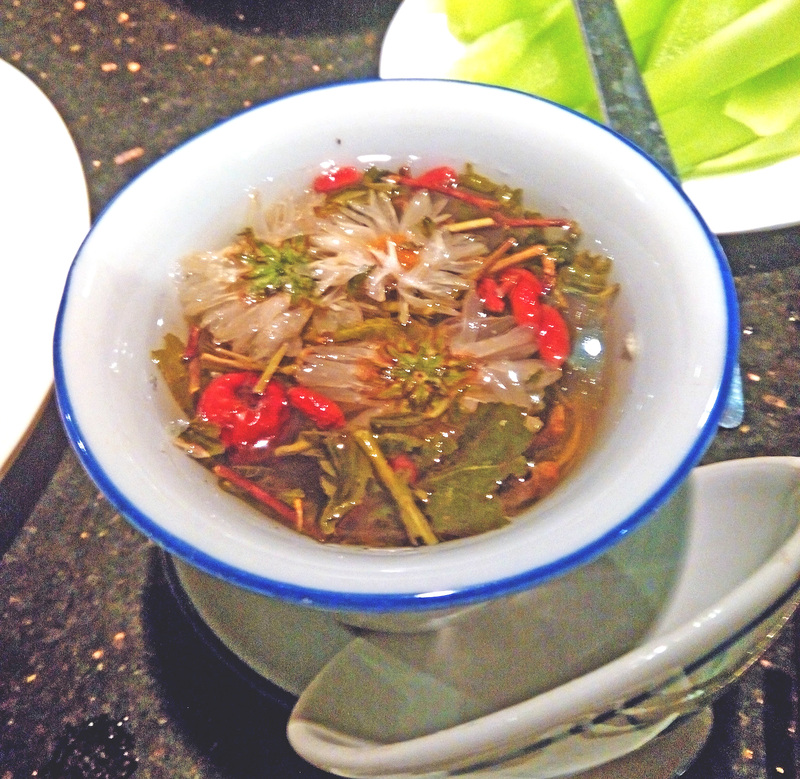 Another time, we went to a place that served fish in a sour, spicy broth. Last Friday, we finally went to Sichuan hot pot, known for the ridiculously spicy soup that will surely make your tears (and snot) run while you’re eating it. As soon as we stepped into the restaurant, my nose started itching from the spice steaming from various hot pots all over the room. When I looked at the red hot soup boiling in our hot pot and the countless chopped chilies floating in it, I was almost too scared to try it. Good thing that for those who don’t like their food spicy, there was a tiny bowl in the center with a non-spicy soup base. But of course, I did try the spicy hot pot. My motto is when it comes to food, I got to try everything at least once! And that includes the gooey pieces of brain shown in the photo above. Boiled in the hot pot, of course! 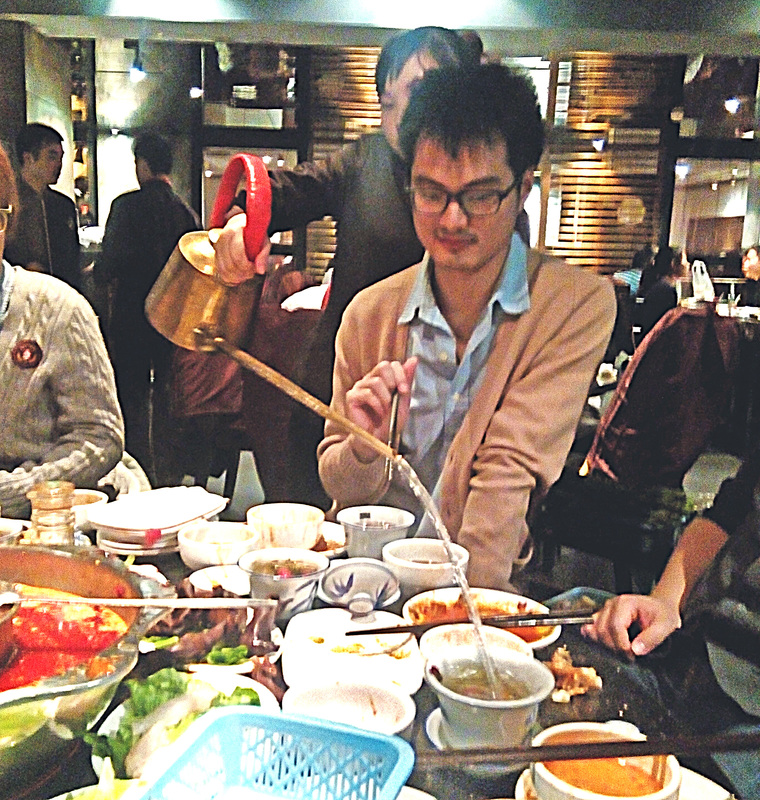 So, did the Sichuan Spicy Hot Pot bring me to tears? Sadly, not! It would have been a much more interesting story if it did. There was much coughing, however, from the steam rising from the pot. Indeed, the food was spicy, but since I learned that people didn’t drink the red soup, you do not really feel the spice. Plus, there was a sesame dip that flavored the food and also reduced the spiciness. The more humorous thing about the experience though was trying to identify the stuff they put in the hot pot. Aside from animal brains, intestines, and stomachs, there were also some stuff that none of us could figure out what the English translation was. An example is something literally translated as a “Leopard’s Tongue,” but it was far from being an actual tongue and more like a tentacle or jelly. Another interesting was how the served hot water for tea using these kettles with ridiculously long spouts (as seen in the photo above). It’s quite terrifying every time the waitress comes to pour hot water because when she raises the spout, you’re not quite sure if she’ll manage to spill hot water on you. I spent part of the meal cowering behind someone every time she came to pour the water. Sichuan hot pot is awesome. 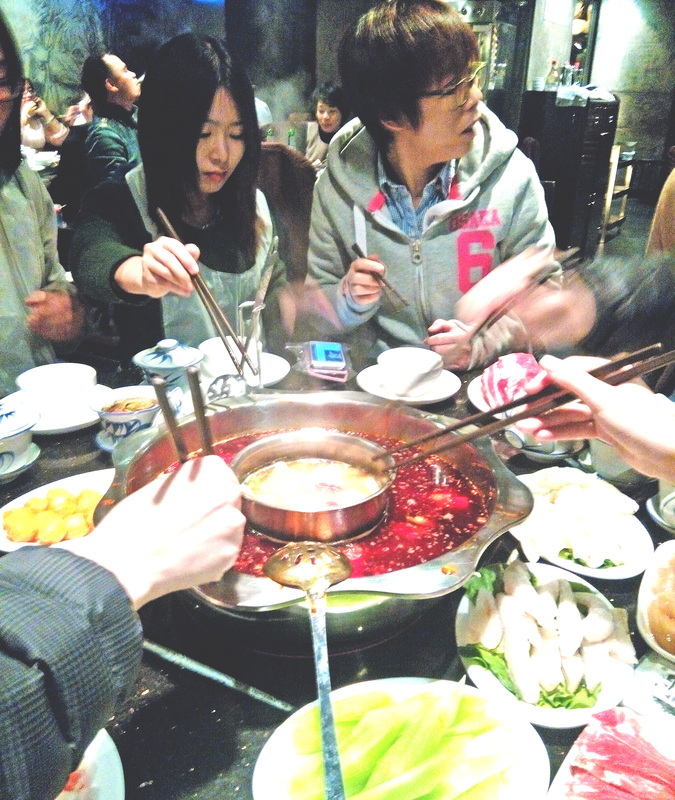 Each region has their own kind of hot pot, including Chengdu hot pot and Beijing hot pot. Some are spicy, some are very mild! Check out 海底捞 (hǎidǐ lāo or Dredged from the Bottom of the Ocean), one of the most famous hot pot chain-restaurants out there. They have excellence service–providing all sorts of entertainment while you wait in line, and you can find their packets of hot pot mix in any large market store. I prefer their tomato flavored hot pot! Sounds great! Definitely have to check out that place! And 加油! Keep at it, I know you can improve with hard work.